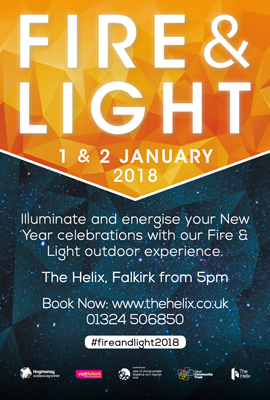 Illuminate and energize your New Year celebrations with our Fire & Light outdoor experience. Back for 2018 with brand new elements to discover! Get wrapped up with friends & family for a walk to take in the night air and explore some spectacular sights. The 4 kilometre illuminated stroll through The Helix Park will lead you to the Kelpies and back. The route will be animated along the way with installations and performers, from beautiful lanterns to fire breathers and other radiant surprises. There will be marshmallow toasting as well as tasty food & drink available to keep you cosy – but please note that they will all be cash sales only. It’s the perfect time to come together and get inspired for the New Year.